A while back, when Gus and I first talked about writing together, he sent me a bunch of ideas he’d recorded. World So Cold popped out as a great song – really catchy and cleverly constructed. He hummed and lala’d a lot of it, with the recurring phrase “world so cold” driving through it – it was about what a crap world it can be. I took it one stage further – when we are children, we can’t wait to grow up, and once we have, we realise, only too late, that it’s a cold, cold world and that there is no way back to the innocence of our youth. I asked Emily and Daisy to sing backing vocals on the track to echo the innocence that we leave so readily behind. I wrote a song in ’81 after Lowell George died, quickly followed by Peter Sellers – completely different people – both heroes of mine. I wrote the song in one sitting and made a single recording of it on a cassette tape. I was so proud of it, I played it down the phone to my dear friend Jo Monro and she said it was the best thing I’d ever written. I lost the tape – left it in a hotel room in Dublin – didn’t think about it again until recently when I found the lyrics in an old folder. I still remembered vestiges of the melody and put some chords to it. When we recorded it, I decided I must have Jo sing on the chorus. The only time we could meet was when she was recording a radio play at the BBC in Maida Vale, so I took my laptop and recorded a scratch vocal to a rough track, while under the watchful eyes of the BBC technicians. Before we recorded she sang what she remembered of the original melody – it was uncannily close to my arrangement. 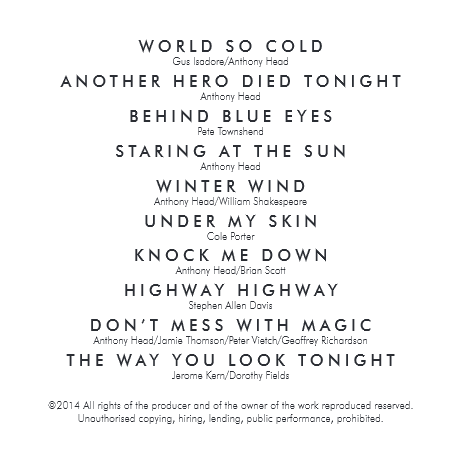 People have been asking me to record a version of Behind Blue Eyes ever since Joss asked me to sing it on Buffy. One problem has always been that, in the original version by the Who, Townshend’s electric guitar kicks in half way through the song and it takes it up a gear – how to keep the song as an acoustic homage? Secondly, I wanted the song to be heard as it never had been before. I asked a friend in LA, Tom MacDonald, to lay down some piano to a guitar arrangement I gave him – he has a wonderful feel, his choices are beautiful. When he sent me what he’d recorded, I knew that’s how I wanted the song – just voice and Tom’s lilting piano. When we recorded Music For Elevators, we had a recurring piano figure appear a few times throughout the album. George (Sarah) asked me to write some lyrics for one of these moments, towards the end of the CD – I wrote Staring at the Sun, and we recorded it, spoken, with massive amounts of reverb on it. When I was putting songs together for the current album, I came across the lyrics – a love song with a bit of a difference – and decided to write a more cohesive melody to them. In putting the demo together, I played with the dynamic of switching between drum loops and live drums and it was a joy to record at Riverside. Seb set up ambient mics all around the studio – even one down the stairs – to get the huge sound out of Jimmy’s drums. I was asked to sing something at a winter themed collection of readings last Christmas, and Sarah suggested I look at Shakespeare’s song. There are a couple of choral versions of it online, which didn’t really resonate, so I decided to write a melody myself. The words are wonderfully ironic – a very clever song about a friend or lover’s betrayal – the chorus is so upbeat, while there’s a real bitterness at it’s heart. I was looking for something tonally like this for the album – and there it was. So I overcame my worries about including “lyrics by Shakespeare” on the CD and recorded it. This was on my list of songs to do, when I was originally thinking of putting together an album of forties and fifties classics – my mum had given me a list of wonderful suggestions, when she heard my version of The Way You Look Tonight. Then I noticed a number of other albums being released, with similar themes, and I decided not to do that, but to build an eclectic mix of songs that suited each other – some original, some covers. A friend who co-wrote one of the other songs on the album, Geoffrey Richardson, asked if there were any string arrangements that I wanted, as that is what he does, beautifully. Under My Skin came to mind – I’ve always thought that it’s a much darker, more haunting song than the way it is usually performed. But in putting a demo together to send Geoffrey – a rhythm track of purely arco bass, cello and a top line – I realised I had pretty much arranged it myself. All that remained was to have it played on real instruments. Will Harris, our wonderful bass player wrote it out in note form, from my demo, and he and Alison Gillies, on cello, laid down the fundamental track. Brian Scott, the driver on Merlin, gave me some lyrics one day and asked if I could put some music to them. They were about a man’s renewed relationship with his daughter – joyous and upbeat. I found a melody relatively easily and recorded it at Riverside as a surprise for Brian. When I decided to include it on the album, I felt that the original was a little too uptempo for the overall groove of the other tracks – a little too Steve Miller, The Joker; I wanted it more Neil Young, A Man Needs a Maid. So Jimmy Copley laid down a great ambient drum track with Dr.Will on upright bass and later we got Charlie Jones to do some harmonica, to seat it in the Neil Young Harvest feel. I was introduced to Stephen Allen Davis, who wrote this song, by a friend in LA. He gave me The Light Pink Album, and I instantly loved this man’s music. Highway Highway resonated so strongly with me, away from my family, driving another road. When I wanted to torture myself – well, release some emotion – I would play this song in my car, and weep. It still has a profound effect on me, even now. It is a beautiful song, by a man whose music should be better known. It was originally recorded, by him, as a guitar track – I wanted to bring something new to it, if I was going to include it on my album. So, when I asked my friend Tom MacDonald, in LA, to record a piano version of Behind Blue Eyes, I asked him to have a bash at this song too. I added the live version of it as a bonus track, because someone said I should – simple as that. I was originally going to record this as a charity single when I left Merlin – it seemed very pertinent. It was actually originally part of a musical I co-wrote some years ago, called D’Ark Secrets. Jamie Thompson and I recorded the tracks with Peter Veitch and Geoffrey Richardson at Peter’s studio. I remember playing them the basic idea, and Pete throwing in the “Magic comes and goes, it grows and grows…” section – it made the song. Sadly, both Jamie and Pete are no longer with us – both died tragically young. The musical went through a number of guises, none of which amounted to much, but the music still remains quite strong and I’m proud of the work we did. So this is in memory of Jamie and Pete. I originally recorded this as a present for Sarah – she loves the song and wanted a simple, straight up version of it, the way it appears in My Best Friend’s Wedding. But every available arrangement of the song seems to be “swung” – apparently, nobody out there in recording land wanted to sing it plain and simple. So I did – with Anders Olinder laying down a beautiful piano part. Some time later, when I was putting the album together, it seemed like a no brainer to include it. The album, for reasons of my own, was initially called “Life in a Bush with Goats” and I was always going to include something like this recording, because I love “goats that scream like humans” (check it out on YouTube). This is an actual recording of the goat that lives next door to us, across the road, (hence the cars) – he does actually scream like a human.